The smart ULTRAHEAT®/ ULTRACOLD® T230 is the new generation of ultrasonic heat or cooling meter especially developed and optimized to meet all residential needs. The meter has impressive features; light in weight, robust, economic efficiency, user-friendliness, and its new individuality. Improved features made for easier handling and understanding. To meet market requirements, customer satisfaction and environmental friendliness we have used a new durable material; the robust glass-fiber reinforced measuring tube is very light and makes the meter easy to handle and simplifies the installation. This saves transportation costs and reduces emissions. The reduction of Lithium batteries with less protects the environment as well. Ultrasonic heating and cooling meters, especially the T230 represent a promising alternative to mechanical meters and it offers a host of impressive and convincing technical advancements. The T230 has significantly lower pressure losses, which simplify the dimensioning of the meter and economize expensive operating current year by year. With the huge dynamic range of 1:1000 all flow rates can precisely be measured, even the smallest. The hard-coded starting value amounts only a few liters per hour and wouldn´t be affected by soiling or abrasion. 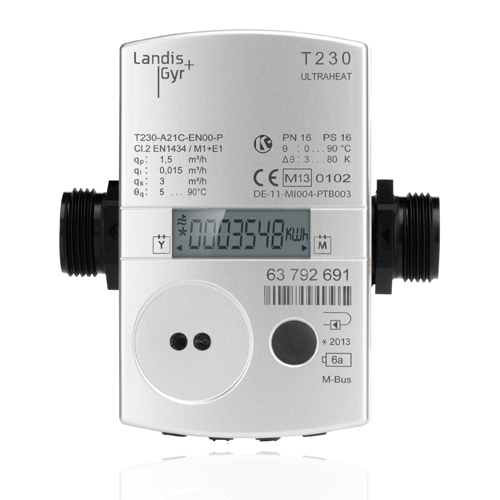 The T230 works with the proven ultrasonic measurement technology of Landis+Gyr giving the highest accuracy, no maintenance and stable measurement for many years. Ultrasound measurement of flow is as precise as over-loadable, also insensitive to dirt in the heating water and it ensures a smooth operation over time. This is what we call state-of-the-art technology.